At one time there were thousands of sod houses dotting the plains region of North America, but the "soddy" in Aline, Oklahoma is the only one still standing in Oklahoma that remains in its original location. A metal building has been erected around the soddy to preserve it from the elements. The exhibits and artifacts in the museum gallery portray the daily life style of Pioneers from 1893 - 1920, with the original Sod House as the key exhibit for visitors to walk through and view. Marshall McCully took part in the land run of September 16, 1893, when the Cherokee Outlet was opened for settlement. 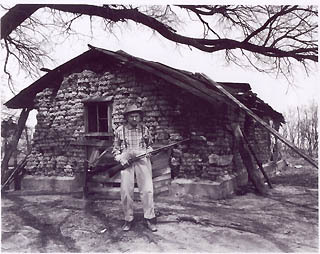 McCully's first claim was disputed, and he moved on to file on another claim, where he built this sod house. At first McCully lived in a "dug-out." The dug out was one room hollowed out of a ravine bank. He built the more spacious two-room sod house in August, 1894. The sod house was built with buffalo grass sod that grew about a mile north of his home site. McCully hitched his team to an 18-inch sod plow and split the grass into long rows. With a flat shovel he chopped the rows into lengths 18 inches long. Then he laid the sod blocks like bricks for the walls. From the trees that grew in the area he split poles and laid them across the top for rafters. Twelve inches of sod placed on the rafters formed the roof. He found an alkali salt spot a few miles west and used the mud from that to plaster the inside walls. Alkali clay helped keep out the insects. It took about one-half acre to furnish enough sod for the house. The floor in the sod house was originally dirt, but in 1895 a wood floor was installed. Ceiling covers were especially needed since the soddies tended to rain dirt, debris, snakes and insects. In many soddies flour sacks were sewn together to cover the ceiling. The sod house was used by the McCully family from 1894 to 1909, when a large, two-story frame house was built immediately west of the sod house and the soddy was then used for storage until 1963. On December 31, 1963, exactly sixty years after McCully received patent to the land, the Oklahoma Historical Society acquired the building. Since that time, the Society has sought to preserve and protect it, and to restore it to the original condition. McCully and his daughter were still available to verify the restoration reflected the authenticity of its original appearance. This historic home is the creative product of A.J. and Carolyn Rexroat. They patiently and meticulously gathered original woodwork, windows, and antiques from area pioneer homes to create a detailed tribute to Oklahoma's historic days.